This week end we heard of the passing of our dear friend Billy Goggins. He took ill in December and died on the 15th of this month. We have known Billy and his wife Esther, for around 50 years and it is hard to believe we will not see him on our next return to Lambourn, though we know he has moved on to a far better place. Billy was originally from Ireland, but moved to England in his early 20's and Noel had the joy of leading him to the Lord almost 50 years ago and always said that he fell into the kingdom like a ripe plum, he was just so ready to accept the 'Good News'. Billy grew quickly in the things of the Lord and was soon helping out in different churches. We lost touch for a while, but events brought us together again when we were on the mission field in Brazil and they were shepherding a church in Farnham UK and ever since we have spent part of our furloughs and return trips to England together. Billy and Esther have been constantly behind us down through those years and a tower of strength in every situation. 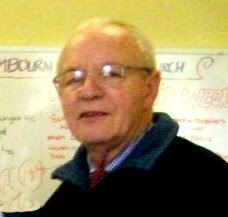 Twenty odd years ago they moved to Lambourn and Billy became the pillar that kept the Methodist church there open. His sincere love for the Lord gave him a real heart for people in all walks of life and many, many lives were touched and blessed by him and his testimony will live on through them all. We will miss you Billy!